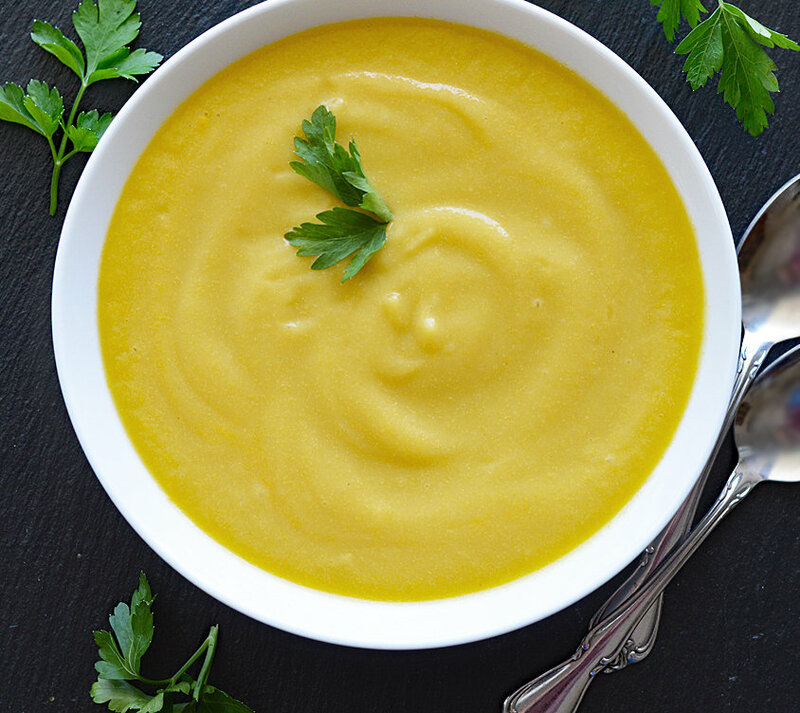 This recipe for Vegan Yellow Squash Soup is so light and simple, but it’s also hearty and refreshingly delicious! 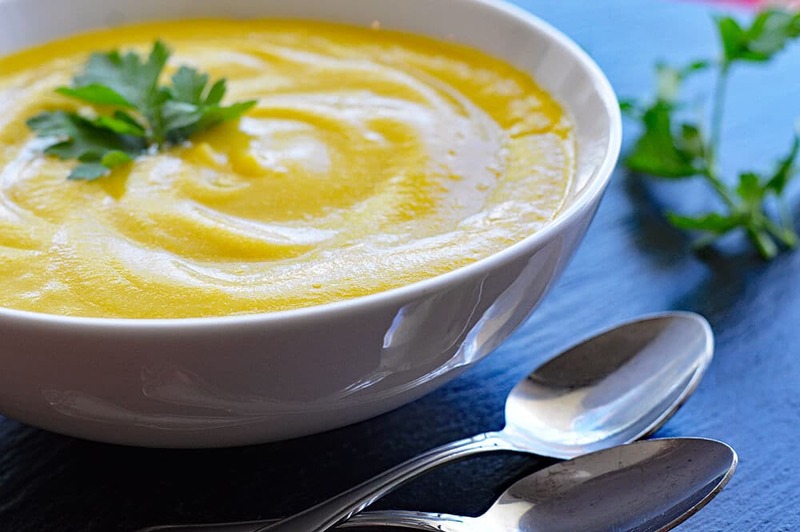 A puree of summer squash, onions, rich vegetable broth and a hint of lemon are the stars of this show. Kick it up a notch and add a bit of vegan parmesan if you’d like. Nutritional yeast works as well. Garnish with fresh parsley or tarragon and you have a lovely first course or main dish. Isn’t it pretty? I can’t even describe that yellow color. You’ll want a rich vegetable broth for flavor, but it also imparts a bit of color. I like Imagine Vegetable Broth. Not affiliated in any way, but it is by far my favorite. You can make this soup as thick or thin as you’d like. The yellow squash is sauteed with onions in a bit of vegan margarine until they are softened and a bit golden. 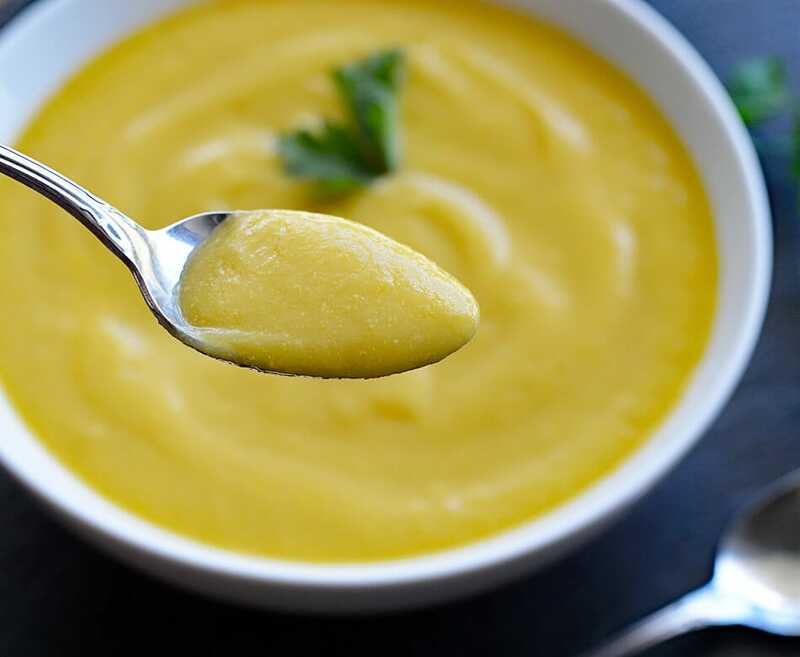 They, along with the vegetable broth are pureed in a food processor or blender. Feel free to add in nutritional yeast or vegan parmesan and season well with salt and pepper. I prefer white pepper so as not to add black specks in the soup, but if you don’t mind the aesthetic, feel free to use black. Garnish with a sprig of Italian flat-leaf parsley or tarragon and serve warm. 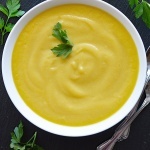 Did you make this recipe for Vegan Yellow Squash Soup? Let me know in the comments section below. In a large saute pan, add the vegan margarine (you could also use oil) and add the onion and sliced yellow squash. Saute until tender and golden. Add the vegetables to a blender along with the broth and lemon juice + vegan parmesan or nutritional yeast (if using). Puree until completely smooth. Season with salt and pepper to taste. Serve warm with a garnish of fresh parsley. « Vegan BLTA Texas Toast Grilled Cheese with NatureSweet Eclipses!